Editor’s Note:This product is reviewed as part of our three-part State of the Market Report on Lightweight Integrated Canister Fuel Cooking Systems 2011. When the Jetboil Personal Cooking System was introduced in 2004, we marveled at its innovation and efficiency, but the PCS weighs 15 ounces (425 g), and it’s simply too heavy to be given serious consideration for lightweight backpacking. Finally, seven years later, Jetboil is introducing a lightweight system. The Jetboil Sol Ti Premium Cooking System is Jetboil’s lightest and most technically advanced integrated canister fuel cooking system. It’s also their most expensive, because it has a Titanium cook pot. Jetboil has made a concerted effort to lighten nearly every component of the Sol Ti system: the cook pot is Titanium, the top lid is a bit lighter, it has a thin neoprene cozy without a heat indicator, the burner unit is lightened up, the cook pot is smaller, and the heat exchanger fins on the bottom are thinner. However, it does have a piezo igniter. Our measured weight of the complete system is 9.8 ounces (278 g). If you are willing to do without the top lid, cozy, and bottom cover the stove can be further lightened to just 7.5 ounces (213 g). In our performance tests, the Sol Ti Premium Cooking System had the second fastest boil time and heating rate (the MSR Reactor was faster), best fuel efficiency, good wind resistance, excellent cold resistance, and excellent burner control. The improved performance is partly due to Jetboil’s new Thermo-Regulate™ Technology, which is a pressure regulator incorporated into the burner that maintains a more constant gas pressure to the burner, so burner output is more uniform as the fuel in the canister diminishes. It also significantly improves stove performance in colder temperatures, as verified by our testing. Jetboil’s range of available companion cups and accessories and included pot support make this and other Jetboil stoves the most versatile in the group of stoves we tested. One bummer we found is the design of the connection between the cook pot and burner. A small slot on the base of the pot needs to line up exactly with a bead on the burner’s flange, then turn to lock. The design is awkward to use, but a Jetboil user gets used to it. 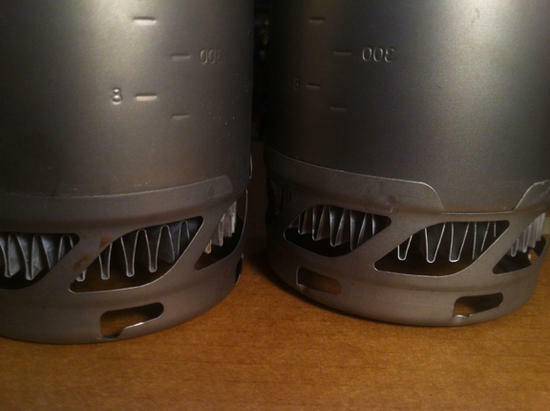 Jetboil apparently stays with the design in order for their companion cups to be backwardly compatible with existing stoves. Also, note that the heat exchanger fins on the bottom of this stove’s pot are very thin and fairly fragile, more so than on the other Jetboil stoves, so more care is required to avoid damaging them. Disclosure: The manufacturer provided this product to the author and/or Backpacking Light at no charge and is owned by the author/BPL. The author/Backpacking Light has no obligation to the manufacturer to review this product under the terms of this agreement. Thank you for the excellent and thorough review. Read this and check the photos. http://blog.bloatedgoat.org/?p=33 Mine has been fine so far. But others are finding fault. Hey, I like this stove and pot kit. The connection setup is similar to an old camera lens bayonet mount attachment, with a twist lock. May take some getting used to remove and replace confidently without spillage or scalding. You can also tweak the fit by bending the lip of the burner in or out to adjust the friction fit against the pot with a pair of pliers. Jetboil does warn against heating the pot while empty. They also mention that you should not allow food to burn onto the bottom of the pot, as it may over heat and damage the fins on the bottom. I wonder if it has anything to do with the dark burn spot retaining more heat against the heat inductors on the bottom. Any complaints about the piezo system is just like every other complaint about them being buggy, nothing new. Keep your pots clean and always bring a lighter. This coordinated approach to integrated cooking systems is the wave of the future. I’d like to see a larger pot available in titanium, maybe a titanium frying pan for the backcountry gourmet. Dream on lightweighters. I've been storing the unit with the foam cozy inside instead of outside. Seems to give it time to shrink back into shape. The cozy may tend to silp loose when hot and wet, but doesn't everything. When calculating the step-in weight for this system, should the weight of an empty canister also be included? You can run this without a canister, and only the fuel gets consumed. If you're comparing to another system that includes a fuel container in the posted weight, then IMO, yes. I did a calculated weight comparison a year or so ago pitting a Caldera Ti-Tri using alcohol mode against a SnowPeak Gigapower. I found the point at which the canister system became lighter to be around 4 days when cooking for two. I believe, per Ryan J., that the Sol Ti breaks even at about 5 days when cooking for one. Thanks to a gould for the weights above. A caution thought on the older black cup if you are BPA sensitive. I received this email on 10/17/2011 from Heather Fernandes, Consumer Relations, JetBoil Inc, "…all of the plastics that we use are BPA free." I'm not sure if that applies to the older cup that came with the original JetBoil. A nice feature for future stove reports would be to built a model based on testing of fuel used for boil X amount of water in some broadly specified conditions, and then calculate the average weight / day for an N day trip which needs Y boils / day. This would make it easy for people to figure out how the stove might impact that experience. For me (doing solo cooking) I found that the Caldera with MLD 900ml pot and Esbits had the lowest daily carry weight compared to any other system I have tried. Canisters were more fuel efficient but the added efficiency never caught up to the esbits. Just about the time the canister looked like I was going to catch up I had to switch to a new canister resulting in the used up canister being dead weight for the rest of the trip. Of course, low carry weight isn't the only factor. The JetBoil Sol is looking tempting from a usability perspective. I am not running off to buy one, but it will go on my wish list if my daughter wants to give me a nice Xmas present. I've been using the BushBuddy for over a year now whenever regulations would allow an open fire. I love the light weight! But on a recent trip, my companions were all using JetBoils, and the efficiency of boiling on the JetBoils was very impressive! Then came this report, and I folded – One JetBoil Sol Ti on the way! I'll still be using my BushBuddy where it's allowed, but given the regs in dry SoCal, I expect the JetBoil to get a lot of use. (Note: I used a Snow Peak Giga prior to the JetBoil where regs prohibited the BushBuddy). Recently purchased the Companion Cup as a second titanium add-on to our Sol Titanium Stove kit. It looks like Jetboil has retooled the lock slots on the bottom of the cup, our original kit was purchased over the Summer 2011. The new titanium pot has a much better action and fit. More like a camera lens mount than ever. Very secure, removes and replaces easily. I’ve included a photo to help illustrate, the new pot is to the right. It’s lightweight and tough, an efficient integrated systematic approach to backcountry food prep, even at the price. I weighed it at 3-3/4oz. stripped down w/o cozy, cap or cup. I have just recently ordered in sale $101 total cost a Sol Ti. I've just biked down to the local REI to look at a Sol Ti ($149+tax) and also to buy a Jetboil 100g and 230g fuel canisters. I also played with the Jetboils on the shelf and looked at the fuel canisters. I'm a 30yr Trangia veteran, with 2L pot cooking habits, who is seeking to learn 1-pot meals to get a lighter pack. The Sol Ti will take me from roughly 1.6Kg down to 500g for a 5day trip, and volume will shrink in roughly the same proportion. – The Jetboil 100g fuel canister (gross 194g, $5) is narrower than the inside of the 0.8L Sol pot. Why? It rattles surely. Why not a little tighter? – The Jetboil 230g fuel canister (gross 356g, $6), is only slightly wider than the pot, a little wider pot would be a snug fit. This canister would give you more than double the duration of fuel (roughly increasing from 12L to 28L) for only 162g additional weight, and the canister costs only $1 more so all that additional fuel is nearly no cost. Why did Jetboil select that particularly pot diameter? Its wide enough so that a 100g canister rattles loose inside, but a tiny bit more pot width would perfectly fit a 230g fuel canister? A cynic would say so they make more profit on 100g canisters? – 0.8L pot size. For boiling water, that is perfectly ok, I'd rarely boil more than 0.5L, my Trangia 0.6L kettle ample, so the space above between 0.5L and 0.8L for water bubble, but if you turn the flame down and attempt to cook, you need more like 0.9L-1L total volume so stirring doesn't push food out the top. I've tried cooking in 0.8L. Doable but trickier than 1L. As a Trangia user, I've had many many cleaning sessions with food which escaped the pot. If you combine all of this, is there a different Sol Ti which could be made, which is ever so slightly wider to fit a 230g canister – to make the argument for this Sol Ti to be truly into the 10+ day range and for that little extra width to be joined by a little extra height and get a 0.9L or 1L pot? A Sol Ti "tour" or "large" option? It would weigh (excluding fuel) a little more (about 8% more as volume is cube of dimensions) and when you put a 230g canister be a 28L water boil system including fuel in the region of 11oz for the Jetboil + 12oz for the canister = 23oz total). Overall, I'm wondering if too much minimalism has taken hold and a tad little extra would take the Jetboil Sol TI PCS into a different zone of longer lighter backpacking. It's about 4 oz heavier- but Jetboil does have a bigger pot for the Sol. Jetboil's Sumo Ti pot is 1.8 liters and will contain a 230 or 450 gram canister attached to the stove. Jim yes I've seen the Sumo its on Jetboils frontpage now, and looking at online vids, implies if you get the Sumo Ti companion pot will turn a Sol Ti into a Sumo Ti? The burner looks the same one. Pot size is quite a jump up from 0.8L to 1.8L, interesting they feel 2 people need more than 2x the volume when in reality there is "stirring height" I'd say about 1"-1.5" needed at the top which is not doubled in height, so if they felt 0.8L for 1 person then say 1.5L for 2 people. The 0.8L pot could have made a fraction larger to fit a 230g fuel, probably about 1L, and not gone the whole massive jump up to 1.8L with the Sumo. I mention this as the weight advantages of canister improves with longer trips and larger canisters as gas's energy density wins over the canister's weight and the burner's weight. Many people will be purchasing the SUMO for melting snow, hence the volume. Nigel – I have four canisters in my garage – MSR, Snow Peak, Primus, and an old Primus I found in the mountains that still has some gas in it. All are very close to the same size except the old primus, which is a smaller diameter adn probably just what you want = but of course it's not made now. So my guess is there aren't any readily available 230gm canisters that are significantly smaller. My other guess is that Jetboil has come to the conclusion that most of its customers will use the smaller canister almost exclusively, so they sized for that. I'd be curious to see how my old primus canister does fit in the small jetboil pot – I wonder if you'd still have room for the burner unit in there. well if Jetboil designed the Sol around the 100g canister, then they *could* have made it narrower and taller if they wanted which would make no sense as then its less efficient (narrower base = less place to absorb heat, taller = less stable), or they could have done the opposite, made it a little wider (more efficient) and a little shorter (optional if they left it the same height it would be a little more 0.8). I mean if you could see this product I've invented (payment via Paypal to me Jetboil!) the SOl+ is 1L and stores 230g canisters which have a better average weight story for 10 days type and be barely affected to those who find the Sol ideal. I agree it's frustrating. Jetboil originally only sold 100 gram "Jetpower" canisters. Clearly the PCS was designed with that in mind. Then they added 230 and finally 450. To me the "integrated system" is really only integrated if the canister can be left attached to the stove. I use 110 gram Snowpeak canisters for family day trips or solo summer backpacking since they were the most capacity that would fit inside. For family backpack trips we have used all different sizes. Our last trip was 8 days and we carried a single 450 gram can. Ended with probably 150 grams of fuel. The Sumo was sized to fit a full Sol (including pot) inside. I'm sure the Jetboil engineers thought that was super-groovy. I think it would have made more sense to fit just the stove and pot support with a 450 gram fuel can, probably making it quite a bit shorter. The Sumo is still tall and narrow so not ideal for snow melting, but much better than the Sol. If it's just boiling water you want, the 1 liter PCS is really as big as I can imagine needing. It safely boils about 3 cups or 750 ml at a time. That's enough for two mugs of hot drink or more than enough for any packaged dried meal. When my family of four is using it we find the capacity is fine- seldom are more than two people ready for hot water at the same time. The next batch is quickly ready. If we're going to simmer a meal we bring a wider 1.75l non-Jetboil pan and the JB pot support. Assuming that one removes the plastic lid and neoprene sleeve, can one use the jetboil sol ti over a wood fire? I'm guessing the weak point will be the welds/epoxy/whatever are holding the heatexchanger onto the bottom of the Ti pot. But, assuming one is willing to deal with the creosote/charring of the pot, will the Ti Sol pot survive regular use on an open fire? Cheers. Oh yes, and happy new year!